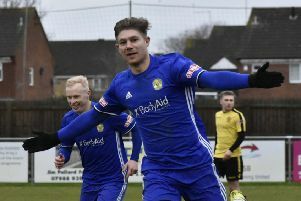 Deeping Rangers closed the gap on UCL Premier Division leaders Daventry Town to six points yesterday (March 30). Deeping gained a hard fought 2-0 away win at Leicester Nirvana courtesy of two headed goals by David Burton-Jones. The win was an ideal warm-up for Deeping going into Wednesday night’s Lincolnshire Senior Trophy final against Grimsby Borough (7.45pm) at Lincoln United FC. Jordan Nuttell was the hero for Pinchbeck United, scoring the only goal of the game at Desborough Town. Pinchbeck stay fourth in the standings. Holbeach United were away at Cogenhoe, the teams placed fifth and sixth in the table respectively, and it was Cogenhoe who nicked it 3-2. Jonny Lockie got both Holbeach goals, the second a cracker. 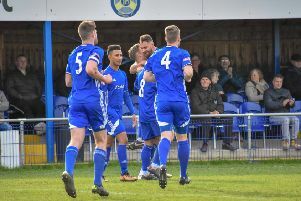 Peterborough Northern Star gained a rare win when taking the honours 1-0 at home against bottom team Wellingborough Whitworth. Ewan Fieldhouse was the Star scorer. In Division One, fifth-placed Blackstones drew 1-1 and were denied victory at Aylestone Park by a home equaliser in the 86th minute. Joint player/boss Lee Clarke had put Stones ahead just before half-time. Bourne Town were 3-1 home winners against Rushden & Higham thanks to golas by Dan Smith, Zak Munton and Tom Cardell. Huntingdon drew 1-1 at home to fourth-placed Bugbrooke St Michael thanks to an Eric Makate goal. In the Thurlow Nunn Eastern League, March Town remain fifth in Division One North after a 2-0 home win against Downham Town. Toby Allen and Jack Friend got the Hares goals. Rock-bottom Wisbech St Mary drew 2-2 at home to Cornard United.